This addon adds a drag and drop Hotbar to the UI. Items on the Hotbar can be triggered via keyboard shortcuts. 1. Open the controls menu, locate the following items, and change them to the values listed below. 2. Find the inventory bag with the name "Hotbar" and drag some items into it. Any item that can be activated will work - potions, quest items, Deathless skills, gear, etc., are all acceptable. 3. Activate items on the hotbar by pressing the keys listed in the corresponding square on the image below. 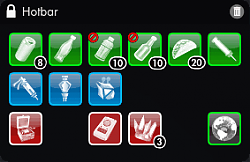 Problem: I don't have an inventory bag named "Hotbar". Solution: If you already have 20 bags, the initial creation will fail and you will see a message in the FIFO area. You will need to either delete at least one bag or rename one of your existing bags to "Hotbar" and then reload the UI for the addon to work. Problem: I've configured my targeting keys the way I like them already. 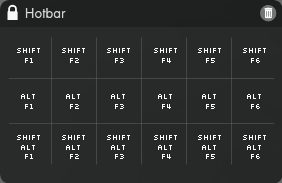 Solution: Assign F1-F6 (or the keys of your choice) to the secondary column. Problem: I'm pressing a hotkey, but something else is happening. Solution: Make sure that another control isn't assigned to the combination you're pressing. Problem: I want my Hotbar to be vertical rather than horizontal. Solution: This is perfectly fine. Just resize the Hotbar window (drag from the bottom right corner). When oriented vertically, the keys for rows and columns swap. The left column is SHIFT, the middle is ALT, and the right is ALT+SHIFT. Problem: I'm getting a message about the Hotbar's number of rows or columns. Solution: The Hotbar must be resized to be either 1x6, 2x6, 3x6, 6x1, 6x2, or 6x3. If it is not one of those sizes, then a message will display on screen when you try to activate a shortcut. Problem: I want to use something other than ALT and SHIFT. Solution: Reassign the "Save Video (Mov)" and "Save Video (Quicktime)" controls to the keys you want to use. Be sure to check that no other controls are assigned to combinations of your chosen keys and the targeting keys. Problem: I'm trying to use two items, one after the other, but the second one is targeting a team member instead. Solution: To use multiple items in quick succession, you must release the ALT and SHIFT keys before hitting the new hotkey. This is simply due to the way the keyboard is read in The Secret World, and cannot currently be avoided. Problem: If I press SHIFT and ALT, then release ALT and hit a targeting key, the wrong item is used. Solution: This is also caused by the keyboard reading in The Secret World. To avoid this issue, always release both SHIFT and ALT if you've hit one that you did not intend to press. Alternatively, do not put items on the third row. available) to the game exiting keys. Use the menu (F10) to exit the game. * Built against the 1.11 source. * Updated to latest Funcom source. latter have proven to be useful during world events. apparently fixes issues with /reloadui and pin buttons. * Fixed Hotbar not updating correctly after zoning.